Admittedly, I have not been keeping up with Captain Midnight. I plan on fixing that oversight pronto. (Pronto? Do people say that anymore? I mean I just did, but wow, it felt weird. Oh well, I’m sticking with it.) I have absolutely nothing against Captain Midnight; I liked the first few issues I read. It unfortunately fell off my radar. But, big credit to Dark Horse and the boys for doing a crossover right. A crossover is supposed tempt you into checking out a book you normally wouldn’t or hadn’t been reading. 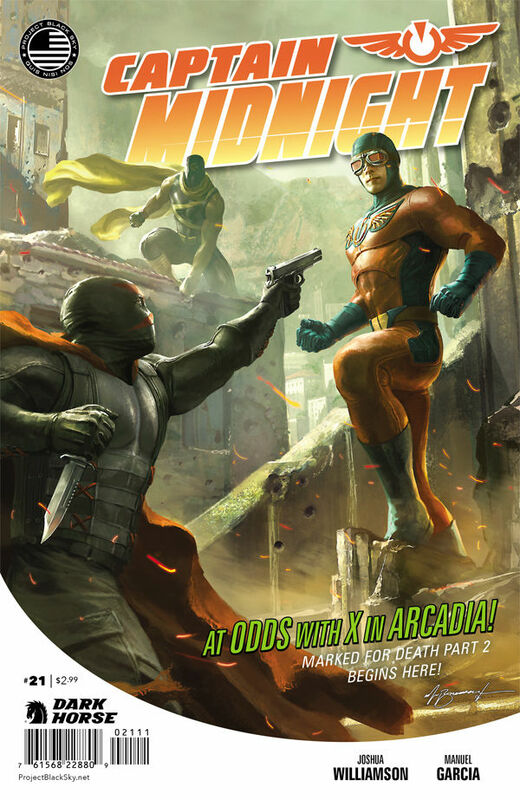 In this case, the vigilante of Arcadia, X makes a guest appearance in Captain Midnight. Now, I dig X a lot. So, because I like X, I thought, “You know what? I should give Captain Midnight a go, see what’s up.” And it worked. I dig what’s happening in here. Joshua and Manuel are serving up some really solid action scenes. There’s an appropriately gruesome opening scene where we meet X for the first time this issue. There’s some cool back and forth between X and Helios that is just twitchin’ to turn into an actual knock-down, drag out brawl. And the panel with Captain Midnight, Helios, The Mark and X all running down the street… that’s a team book I’d look at a lot. But it’s not all action, action, action. Joshua and Manuel also serve up some pretty personal moments between Cap and Joyce, the woman he was ripped away from when he got himself hurled into the future/our present. There’s also a nice subplot with Captain Midnight’s Scooby Gang (yeah, I called them a Scooby Gang) doing some atypical Scooby Gang stuff. Instead of hanging around waiting for the word from Cap, they form a plan and figure out a way to infiltrate Black Sky on their own. I really liked that aspect of this issue. Plus when you throw in a cool looking bad guy at the end, my little geek heart just grows three sizes. Unfortunately, since I haven’t been keeping up with Captain Midnight, I don’t know who the half-metal-dual-sword-wielding-snake-on-his-chest guy is. But man, he’s cool looking and I’m a sucker for cool looking bad guys, so I don’t even have to know what his name is to know I want to see how this pans out. So I either picked a great time to hop back on to Captain Midnight; because cool things are happening… Or a really bad time, because we’re just a few issues away from the end of this run of Captain Midnight. Either way, good things are to come.